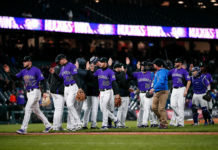 Members of the Colorado Rockies and the San Diego Padres have been disciplined for their roles in the bench-clearing incident that occurred in the bottom of the third inning of Wednesday afternoon’s game at Coors Field in Denver. Joe Torre, Chief Baseball Officer for Major League Baseball, made the announcement. Padres pitcher Luis Perdomo has received a five-game suspension for intentionally throwing a pitch at Rockies third baseman Nolan Arenado and then fighting. 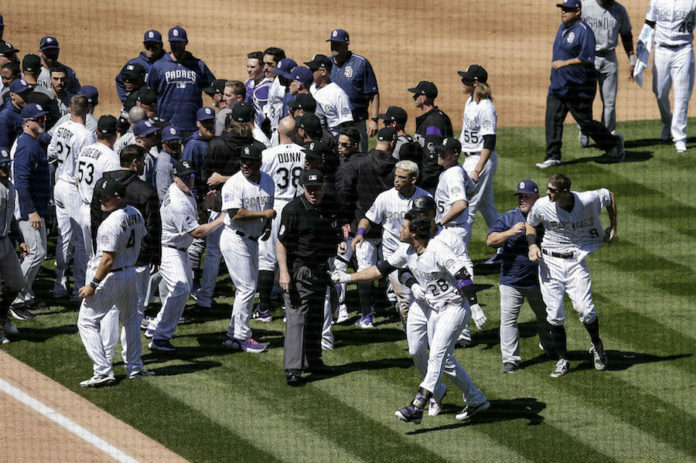 Arenado has received a five-game suspension for charging the mound and then fighting. Rockies outfielder Gerardo Parra has received a four-game suspension for fighting during the incident. Padres pitcher Buddy Baumann has received a one-game suspension for fighting during the incident. Perdomo, Arenado, Parra and Baumann all received undisclosed fines in addition to their suspensions. According to Patrick Saunders of the Denver Post, Arenado will appeal his suspension. Players who were fined for their actions during the incident were catcher A.J. Ellis and infielder Freddy Galvis of the Padres and pitcher German Márquez of the Rockies. 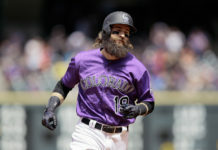 Unless appealed, the suspensions of Perdomo, Arenado and Parra are scheduled to be effective tonight, when the Padres are to host San Francisco and the Rockies are to visit Washington. If any player elects to appeal, then the discipline issued to him will be held in abeyance until the process is complete. 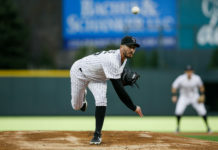 The suspension of Baumann, who has since been optioned to Triple-A El Paso, will be effective upon his return to the Major Leagues, pending appeal.